Thanks to innovative food hybrids like the Nugcho, the sushi burrito, and the buffalo chicken lasagna, we live in a world where we're no longer limited to eating one delicious food at a time. 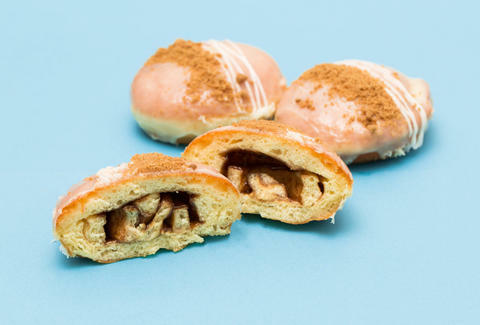 And now, someone's finally solved the delicious dilemma of having to choose between either a cinnamon roll or a donut by combining the two pastries into one: the Cinnamon Roll Donut. Cronut, take notice. Believe it or not, these fistfuls of cinnamon and sugar combine an entire donut with an entire cinnamon bun that comes seamlessly baked right in the center. Enough said. Obviously, we had to get out mouths on these things, so we contacted the mastermind who makes them, Chef Thiago Silva. He created the Cinnamon Roll Donut while serving as pastry chef at Catch in NYC's Meatpacking District. But now, he's working on opening a location where he can sell the donuts, and presumably other cool things -- "coming soon," he said. Until then, Silva said the donut is still available on Catch's dessert menu. But he brought us the latest version of the donut, topped with streak of cinnamon crunch and drizzled with cream cheese frosting. They didn't last long. Besides the fact you're eating two things at the same time, the Cinnamon Roll Donut ends up offering particular advantages over eating a cinnamon roll or a donut separately. 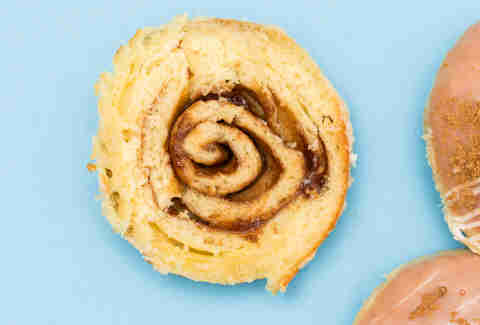 You get all the sweet and spicy gooeyness of a cinnamon roll without having to eat through or tear off what's usually a crispy and often frosting-less outer layer. Meanwhile, its placement inside the donut affords it a fluffy thickness without making the donut too caky. Flavor-wise, it tastes more cinnamon roll-y than donut-y, but in a good way. It's like eating a muffin made entirely out of muffin tops, and it's spectacular. Of course, an important part of eating one is revealing the cinnamon roll center. For the best Instagram money shots, Silva recommends cutting them down the center or carefully slicing the top off, like we did in the photo above. That is, if you can pause long enough before eating it, and not get frosting all over your phone. These donuts are dangerous. In a good way. It's simple: you can finally get the best of both a cinnamon bun and a donut, all at once, in a package that works and tastes fantastic. Sure, they might be insanely sweet, but what the hell did you expect from a cinnamon roll-stuffed donut? 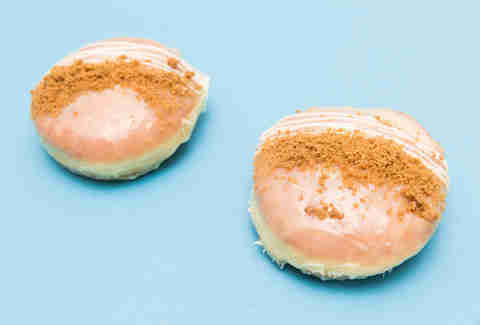 Most importantly, the Cinnamon Roll Donut is not one of those halfhearted, gimmicky mashups that merges elements of one food with another, but rather a true hybrid that is ultimately greater than the sum of its parts. Let's just hope Silva gets that location up and running soon. Tony Merevick is Cities News Editor at Thrillist and needs to be wheeled out of here in a stretcher. Send news tips to news@thrillist.com and follow him on Twitter @tonymerevick.